Whisk egg yolks with 3/4 cup sugar until mixture is thick and pale yellow. Use paring knife to slit the vanilla beans down the middle and use a spoon to scrape out the seeds inside. Add the seeds to the heavy cream in a large saucepan over low heat. Bring the cream to a brief simmer but be careful not to let it boil or it will overflow the pan. Remove from heat and use some of it to temper the egg mixture. Slowly mix it all together (adding the hot mixture to the eggs too quickly will cause the eggs to cook) and then divide into 6 6-ounce ramekins. 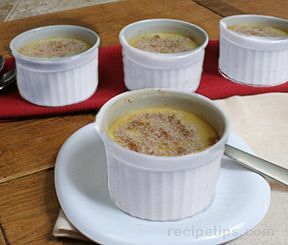 Place ramekins on a cake sheet or roasting pan and fill pan with water halfway up side of ramekins. Cover loosely with foil to avoid browning. Bake at 325° for 30-40 min. until barely set around edges. Chill ramekins in refigerator for 2 hours. 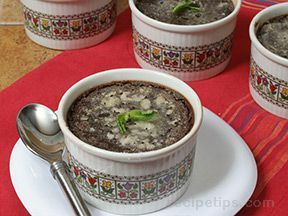 Sprinkle a tablespoon of sugar on each before serving and use kitchen torch to melt the sugar and form a hard crust. Serve immediately. 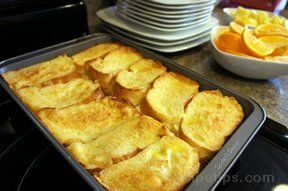 Can be served with fresh raspberries or sliced fresh strawberries.